Madison’s Bishop Morlino Celebrates 15 Years! –who was installed as Bishop of Madison 15 years ago today, on August 1, 2003. Madison Catholics are overwhelmed with the blessings this Bishop has brought to our Diocese, and we return with gratitude the love this Bishop so obviously has shown for all of us. Bishop Morlino has loved us, taught us, and led us now for 15 years. He probably has no idea how much he has done for all of us, both as a Diocese, and as individual Catholics, parents, and children! He has the perfect touch, balancing truth with love while he teaches and shepherds. 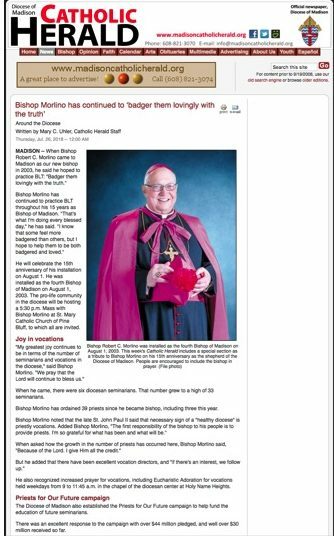 May God bless Bishop Morlino very richly both now and forever! “President” Cyrus; No Leader In the World is Powerful Enough to Thwart God’s Purposes or Bishop Morlino: Difficult Week? Rejoice!